The Newport Bermuda Race has long been well known for the variety of the challenges it throws at sailors. Sometimes there are calms, at other times storms, often there’s overcast, and occasionally there is the distraction of a stunningly beautiful night. The sea is not always so pleasant. 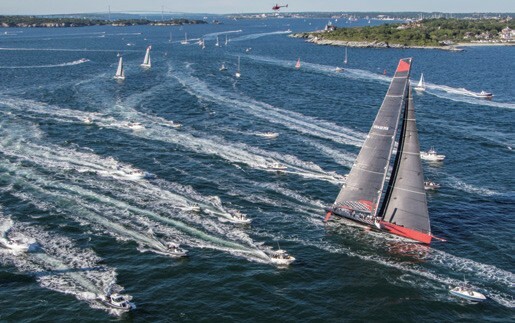 When weather forecasters predicted before the start on June 17 that the entries would be battered by storms, 50 crews dropped out, leaving 133 boats to start the race. The forecast turned out to be correct only in the far eastern part of the course. Boats there had 45-knot winds and no reported damage. The crews were also resilient as well as creative in the strategies they chose to deal with the race’s other challenges. Jim Clark & Kristy Hinze Clark’s 100-foot sloop Comanche (Newport, RI), in the race’s Open Division, set out to break the 635-nautical mile Newport-Bermuda sailing speed record. The intricate course chosen by navigator Stan Honey to find favorable wind and avoid unfavorable current led to a speed record of 34 hours, 42 minutes and 53 seconds, for an average speed of 18 knots. Well astern of Comanche, boats in the race’s four other divisions (another, Gibbs Hill, had no entries) managed the typical rough Gulf Stream waters, and then dealt with a cold eddy, a large pool of swirling cool water, that forecasters had predicted would provide a favorable boost of current toward Bermuda. Some navigators intentionally sailed their boats into the eddy. Others who believed this was too good to be true kept their distance—correctly, it turned out. The eddy had shifted position and the boats in it were set back, not forward. The boat in the St. David’s Lighthouse Division that came out best in these perplexing conditions was Christopher Sheehan’s Xp44 Warrior Won (Larchmont, NY). Hard-working Navigator H.L. Devore set a course miles east of the eddy, going so far as to sail at right angles to the rhumbline to Bermuda in order to get farther away. Obsessively checking the weather forecasts—he claimed he did 200 downloads to Warrior Won’s computer in two days—Devore and his shipmates neared Bermuda with a light following wind in a pack of six similarly sized boats, all of them jibing aggressively down the course to St. David’s Head as though they were small boats racing for an Olympic gold medal. 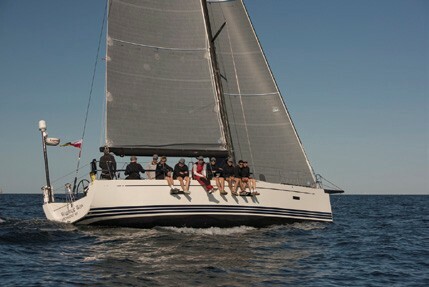 The first boat to finish in this group (and the second in the race after Comanche) was the Tripp 41 High Noon (Kings Point, NY) with a crew of seven well-trained teenagers and three adults. Warrior Won finished close enough for her time allowance to bring her ahead of High Noon and win the division. Crewmember Carina Becker writes about the race aboard High noon. These changing forecasts and conditions affected the other divisions, too. In the Double-Handed Division, Zachary Lee and his crew Gus Stringos felt some pressure not to enter Yankee Girl, a Morris 36 Justine-class sloop (Chilmark, MA), but they did start under an agreement that should conditions become threatening, they would turn back. Their AIS (automatic identification system, required in Double-Handed boats) tracked opponents’ positions and maneuvers as they ran before the wind to the finish. Lee hand-steered through all but one of the last 24 hours of the race. When he later told a visitor, “I’d like to attribute my success to a good crew and lots of luck,” what went unstated was the power of aggressive sailing tactics. And yet D’Arcy later wrote, “We are approaching Bermuda and as other boats converge our angles of approach will continue to get narrower and we will once again see boats which will be an exciting sight. Currently, we have a competitor on our tail, and hope we can keep them there.” The division winner, which avoided the eddy, was Daniel Biemesderfer’s Mason 43 Shearwater (Guilford, CT), a powerful, heavy boat that, to judge by reports, was raced as hard as the high-performance entries. The oldest boats in the fleet, at least in design, were in the Spirit of Tradition Division. Until this year, the replica Bermuda “sloop” Spirit of Bermuda (Hamilton, BER) has not had any competition in Bermuda Races. 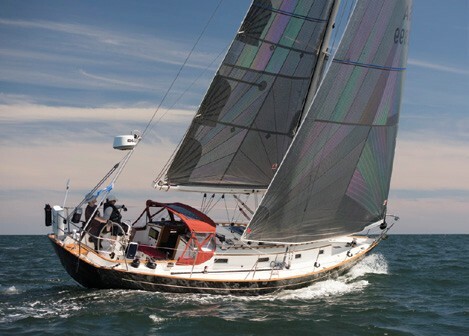 But this year America, Troy Sears’ semi-replica of the yacht whose name is on the America’s Cup, came around from San Diego and entered the race against her along with Bob Eichler’s S&S 96 Altair (Seattle, WA) and Frank Blair’s cat-rigged schooner Farfarer (Port Mahon, DE). The sight of these yachts on one starting line was entrancing. Spirit of Bermuda went on to win the race. Sailor-writer John Rousmaniere’s books include The Annapolis Book of Seamanship, Fastnet, Force 10, and a history of the Bermuda Race, A Berth to Bermuda. 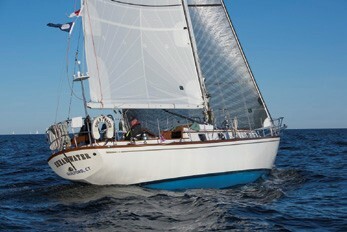 He has sailed in ten Bermuda Races.